My family has been in Tennessee since shortly after the Revolutionary War, when one of the Bowers ancestors got a land grant. That branch of the family came from England long before that. Sometimes I have wondered if some of the characteristic expressions that Mother, Daddy and various of my aunts and uncles used go back that far. Most of them were vivid, descriptive and not anything my friends from other places (like Pennsylvania, for example) had ever heard. Mother used to complain that someone “high-hatted” her, which meant to act in a snobbish or condescending fashion, i.e., this person thought she was better than Mother. There was no greater offense to Mother than to be looked down upon! 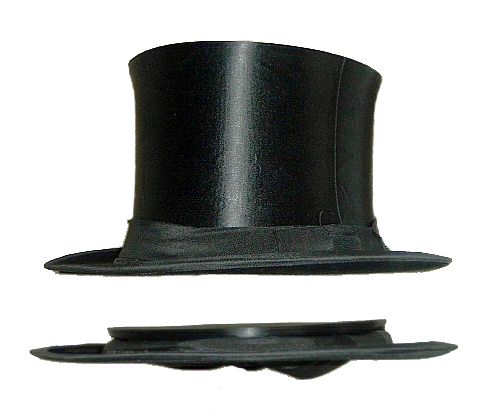 It looks like the term is derived from a “high hat” like a beaver or a topper which a snobbish person might wear. Another one was to “be on your high horse.” This means “to be disdainful or conceited,” according to the American Heritage Dictionary. Used in a sentence: “Don’t you get on your high horse with me, young lady” (usually addressed to me). This expression goes back to late Middle English, according to the online dictionary! 1375 – 1425, to be precise. Who’d a thought? My favorite, however, is “poor dog wouldn’t wag his own tail.” This one is complicated. It means, someone who is boastful or bragging, or it can mean someone who is too proud to speak of their own accomplishments. The irony and understatement make me laugh. When I looked it up, there’s another expression I had never heard: “It’s a sorry dog that won’t wag his own tail.” Apparently this one is from Georgia, and means self-promotion is ok. The quote was from a judge in Atlanta. Anybody else have a strange or funny saying from your family?